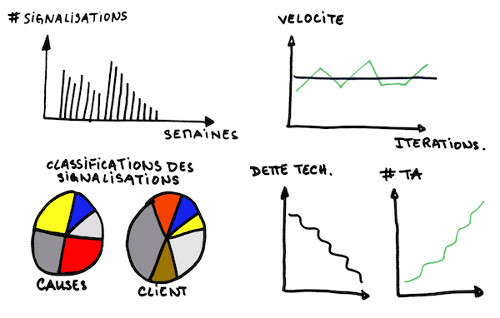 A few weeks ago, as I was looking the internet for Lean principles to improve our way of working, I fell upon this book Petit guide de management lean a l’usage des équipes agiles (NB: the book is in French, the title means ‘Little lean management guide at the usage of agile teams’). It made me think and I thought it deserved a blog post. It explains that agility can be though of as a set of practices and principles, shared through a huge community. This makes it a great production system, where improvement are mostly brought by gut feeling retrospectives and trial of other teams practices. At the contrary, Lean is very light framework for continuous improvement, relying on a more systematic waste elimination. They start by showing the issues, by categorizing them from the logs, they discover that they are mainly related to training, network, but surprisingly, the majority (30%) cannot be categorized and fall in the ‘unknown’ category. By improving logging, the unknown category falls to 5% ! Fixing network timeout issues then makes the client a lot happier. The authors conclude that while uncomfortable, going to the clients increased motivation for everyone, fixed issues and made the client happier. An author is called to help a team which is working on unifying reimbursement systems after a merge. The project is late and the product is unreliable. 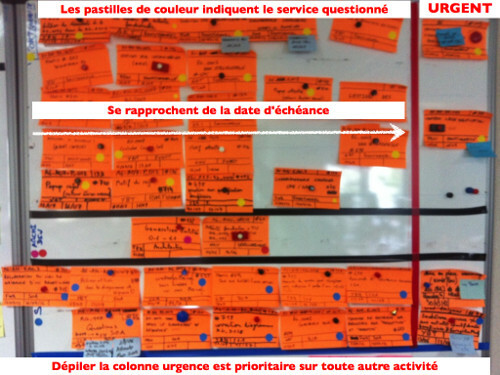 The flow whiteboard shows that tasks get stuck when in need of clarifications from business analysts. Tension between people is already increasing. They Team decides to visualize this with ‘blocker’ post-its. 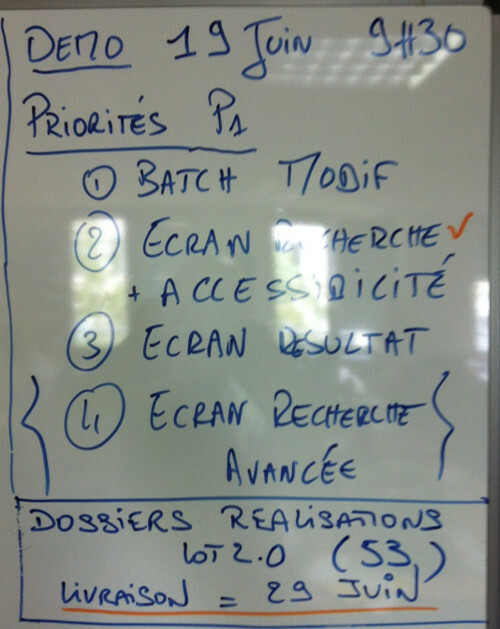 After an inquire with the BAs, it turns out that they don’t see the waiting tasks the issue management software. Tickets are discussed at the stand-up, and unblocked issues are also visualized. As a result in only 2 weeks, the process fluidifies, and the tensions decrease. This story starts in a rather typical way : the client would like the team to go faster. The team engages into a series of Plan Do Check Act cycles. 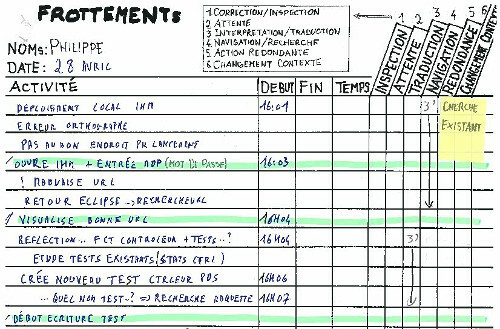 For a few weeks, the authors keeps a daily log of the team activities during after every stand-up meeting. It turns out that writing tests accounts for 5,5% of the time, refactoring for only 2% but programming for 40% ! Hypothesis 3 : if there is something to improve, it must be in programming. For 20 half days, the author embarks on the tedious task of keeping a very detailed log of activities while taking the role of navigator in pair programming sessions. First, they avoided loosing time on improving the wrong thing The team also agreed on the practice of asking for help at the good person when starting stories. Doing that, they got a nearly 100% speed boost ! I personally found this book to be just great ! It’s short and focused, pragmatic, and a pretty easy read. If you liked Scrum and XP from the trenches I think you should read it. More generally, I think it’s very useful for anyone involved in the development process who would like to push agility a little further. There’s a catch though, it’s in french ! I guess I could take the time to translate it, tell me if you are interested.